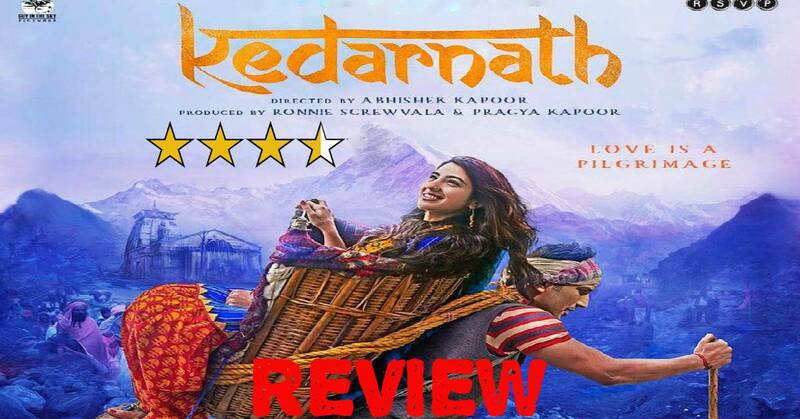 Kedarnath Movie Review: A Serene And Endearing Love Story Set Against The Backdrop Of The Devastating Uttarakhand Floods! Kedarnath revolves around your endearing and quintessential love story set up against the backdrop of the devastating Uttarakhand floods which took place in the year 2013. The film has certain loopholes in the script but those are mainly overshadowed by some passionate performances specially by debutante Sara Ali Khan who manages to impress to the core in her debutante act. Here is one newbie who is a thing to look out for. The film opens in the picturesque locations of Kedarnath for which cinematographer Tushar Kanti Ray has done a splendid task. The beauty and serenity of the Himalayas are captured in a beautiful manner. It also highlights how the locals leave no stone unturned to serve the pilgrims and how the Muslim pithoos ( people who carry the pilgrims to the shrines of Kedarnath ) shatter all the barriers of relegion and worship Lord Shiva whole heartedly. There is a sense of powerful relegion and secular paradigm in the story penned by Kanika Dhillon and Abhishek Kapoor. The film also has a powerful take on the excess commercialization on the shrines of Kedarnath which has taken a toll on its environmental, ecological and natural being and is one of the indirect causes of the natural calamities. The script deals with such thought provoking issues. Despite of some dragged moments, Mansoor (Sushant Singh Rajput) and Mukku (Sara Ali Khan)'s love story comes across as innocent and endearing. The show stealer is however the gripping and pumped up climax. The pace and dram mainly unfolds from there. Sara Ali Khan brings a vivacity and a charming energy into Mukku. She resembles a younger version of her mother Amrita Singh from the film Betaab. She brings out an excitement to her performance with ease. Not to forget her lovely and youthful face adds on to her performance. Sushant Singh Rajput is an efficient companion to Sara's energetic debutante act but he appears to try too hard in some scenes. One of the highlights of Sushant's performances is when he does the blushing act after drinking tea from the same cup as Sara's or when he sings Lag Ja Gale near the bonfire. The soundtracks like Quafiraana, Jaanisar and Sweetheart adds to the journey of Mansoor and Mukku's love story. But it is the track Namo Namo sung by Amit Trivedi which effectively captures the devotional spirit of Kedarnath. Abhishek Kapoor has done an honest attempt in creating this love story against the backdrop of the Uttarakhand floods despite some fictionally correct scenes. But it is the strong climactic portions which adds an intensity to what could have been just a cliched love story. The effective usage of the CGI only adds to the intensity of the script especially to depict the terrifying devastation of the shrines and the households of Kedarnath. Watch this one for reliving that fateful calamity which caused such innumerable havoc and the powerful debut act of newbie Sara Ali Khan.